It’s easy to create your own savory & sweet candy bacon concoction. This is the perfect appetizer to serve if hosting a brunch. Or bring it into the office on a weekday morning as a pleasant surprise for your colleagues. 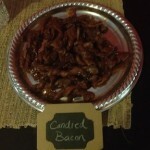 Candy bacon is sure to please anyone who lives both meat and sweets. Ron Swanson would love this dish. Our recipe includes a generous dash of Tex Blair’s Everything Seasoning Spice Rub, but y’all can include any flavor which suits your palette. To make this dish, simply purchase a package of bacon, a bag of brown sugar and ensure your spice cabinet has cinnamon, black pepper, nutmeg and ground mustard. If you don’t have any of those seasonings, then just purchase a bottle of Tex Blair’s BBQ Rub and it’ll provide all the flavor needed. We also like to top it over ice cream, like Honeysuckle Gelato’s “The Kang”. Remove it from the plastic wrap and place it on your cutting board. Slice that bad boy in two. Pour 1 cup of brown sugar and your “essence” as Emeril likes to say in a bowl. For our essence, we like either a combination of cinnamon, nutmeg, black pepper and ground mustard or your can use a heft helping of The BBQ rub. Take your pieces of bacon halves and dredge them in the brown sugar mixture. Twist each slice, then place on a greased bacon sheet. Pop in your oven for 25 minutes at 375 degrees (and flip on the broiler for 2-3 minutes towards the end) for a perfectly sweet bacon treat. 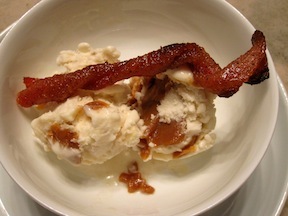 If y’all really want to wow a crowd, serve with Bacon Waffles & Ice Cream. Note: if making this for an early-morning event, y’all can season and twist your bacon the night before, then place it on a cooking tray lined with parchment paper. Cover with plastic wrap then place in the fridge and keep for up to 24 hours.